One of the great pleasures of food, for me, is having the opportunity to use ingredients fresh from the earth. Spring is the beginning of the season where Mother Nature’s bounty becomes accessible to us once again, and for many people, seasonal spring foods are a bit of a celebration. The good news is that even if you aren’t planning to hunt your own mushrooms, you can purchase dried morel mushrooms at many larger grocery stores, as well as order them online. We are lucky, even though our weekend hunting didn’t result in a basket full of ‘shrooms, we have a friend who shares with us the morels he finds when mowing his yard! What a guy, huh?! Since he is so generous with one of our favorite treats, I return the favor when we make fresh sushi rolls at home, and send a few in his direction. Simmering cream with the criminis and leeks. I prefer to work with either an enameled cast iron skillet for this, or Caphalon because they are nice and heavy, but use whatever is comfortable for you. Cook the diced bacon down slowly until it begins to crisp, and the fat is rendered. Remove the bacon to a plate using a slotted spoon and set aside, reserving the bacon fat in the skillet for sautéing the morels. With the fat heated over medium, carefully add the cleaned morels, minding them closely and turning as needed until they brown up a little and seem done, about 10 minutes. 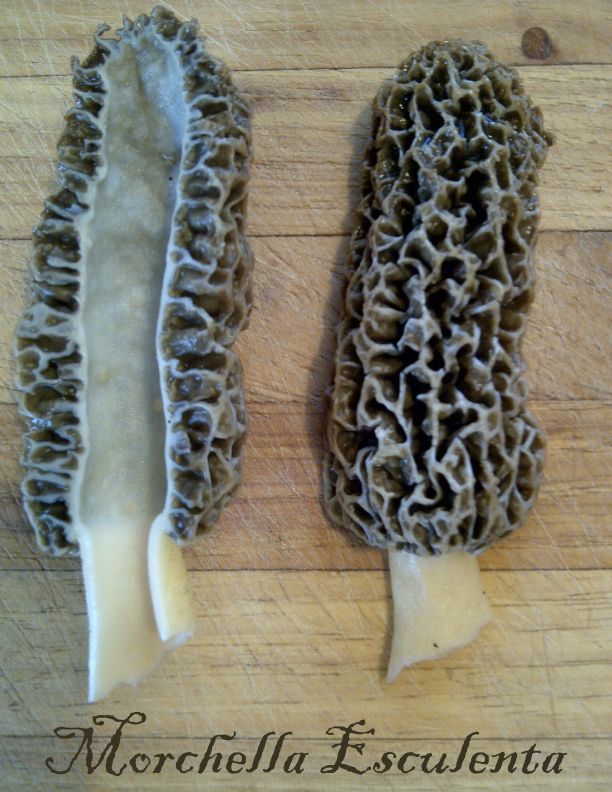 Remove morels and set aside. 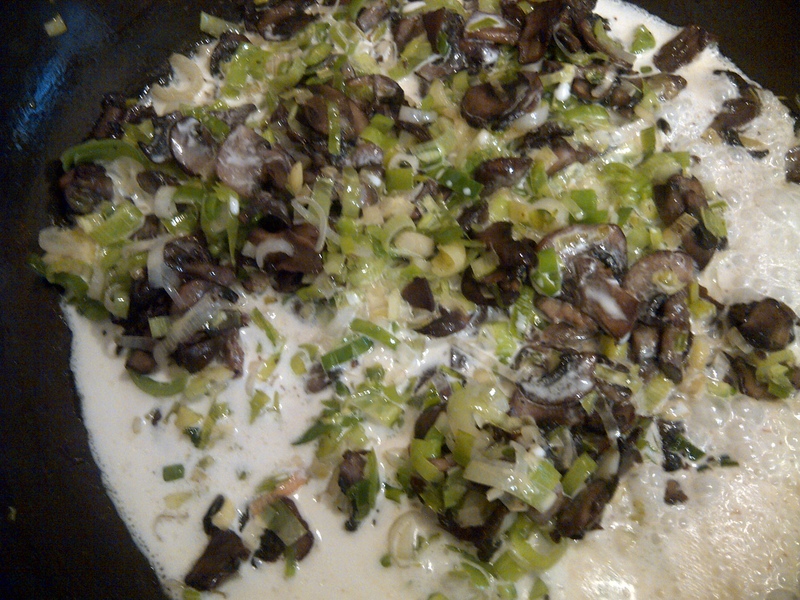 If there is enough fat remaining in the pan, add the sliced crimini mushrooms, or add a Tb or so of butter first. 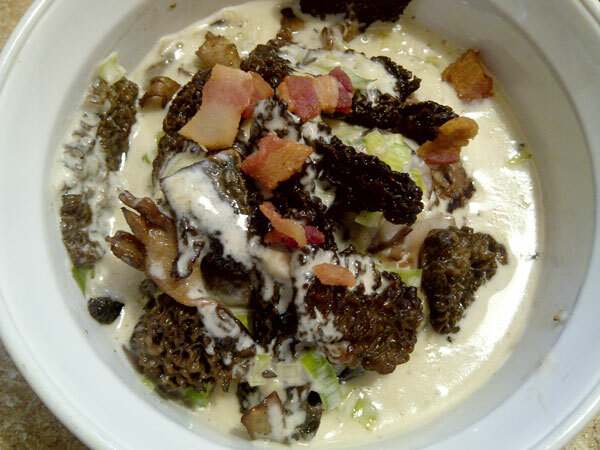 (If you are wondering why I didn’t cook both mushroom varieties together, it’s because I don’t want the morels cooking down into the soup, I would rather layer them on at the end, as the spotlight of the dish.) Cook the crimini mushrooms for 5-10 minutes, until they begin to look done. 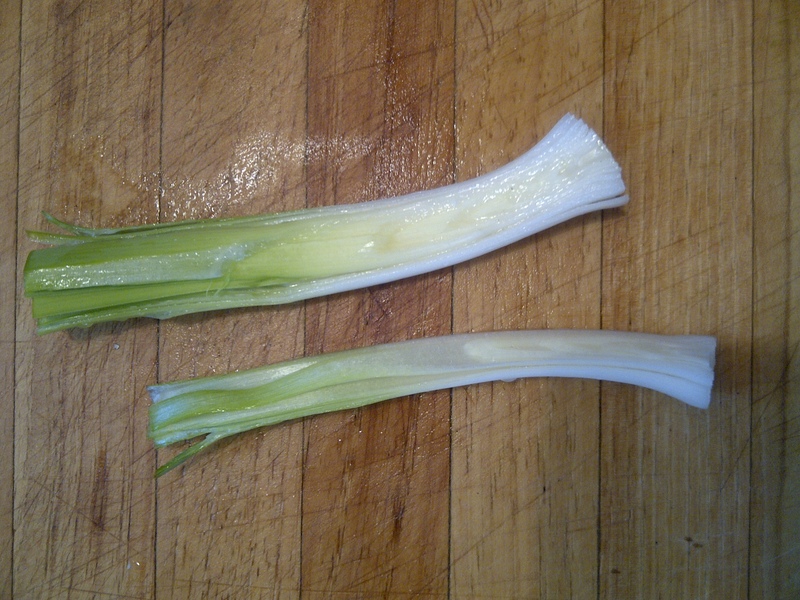 Leeks are notorious for being very dirty, so be sure to split them lengthwise and rinse all sections in water before using. Add a little more butter if needed and add the sliced leeks, cooking for an additional 5 minutes or so, until they begin to soften. Slowly add the cream to the pan, not quite covering the mushrooms and leeks, and simmer over low heat for another 5 minutes, stirring frequently with a heat-proof spatula or wooden spoon. Add the shaved Parmesan to the pan, stirring to allow it to melt. Add salt and fresh pepper as desired. Dish into bowls, top with morels and bacon, or serve over a small tender burger, as we have done. Makes 2-3 servings. 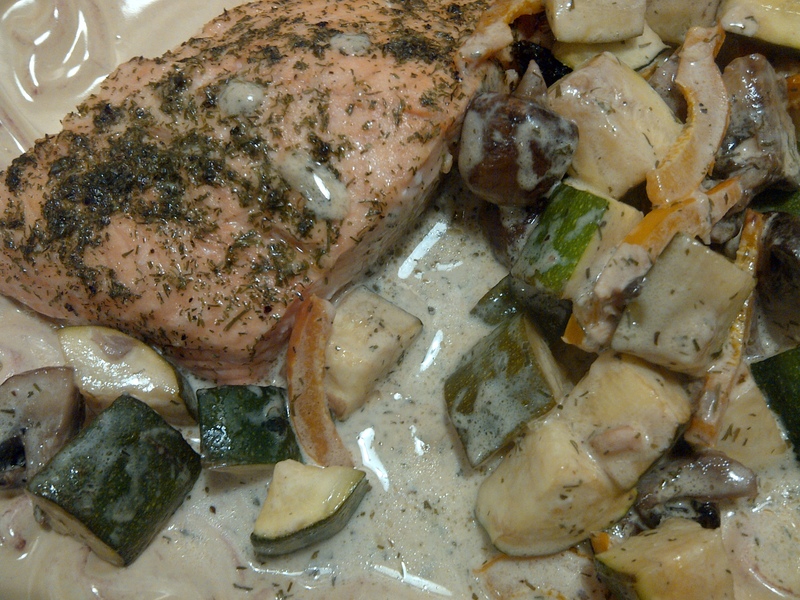 As always, this recipe is free from gluten, free from wheat, and low-carb, though it is quite high in fats. While I do use fats in my gluten-free lifestyle, this is not the kind of rich meal we would eat every day, but what a treat it is for a springy Sunday afternoon! The servings are smallish, and every bite is worth savoring, mmmm. We pretty much all grew up loving cookies. The taste, texture, the wonderful associations of a loving kitchen and all the dreamy smells… anticipating dunking it in a glass of milk while still slightly warm. Cookies are a part of our heritage, and yet, when made the traditional way, some would argue that they are toxic. OK, I would argue that they are toxic. That doesn’t mean that when we abandon gluten, we also have to abandon treats… we just need to revamp them into healthier creations that actually satisfy and provide nutrition. 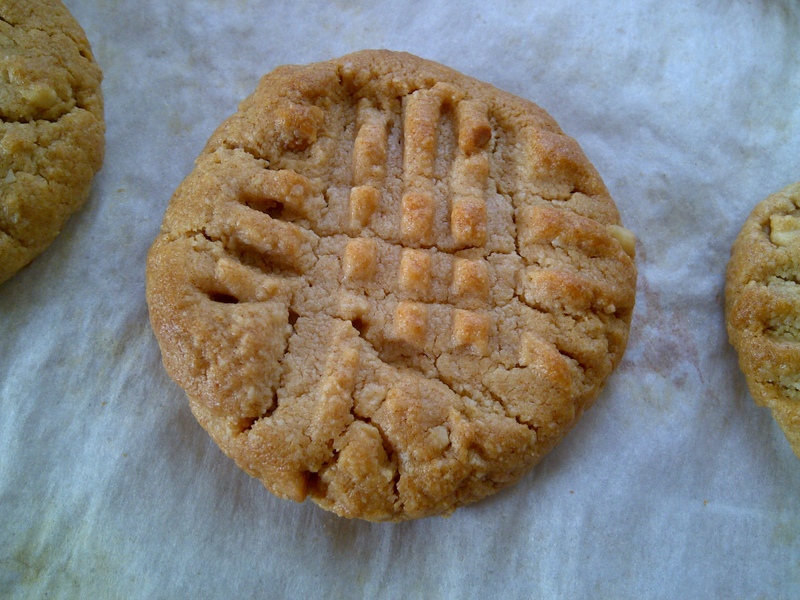 This peanut butter cookie recipe is adapted from Elana’s food blog. 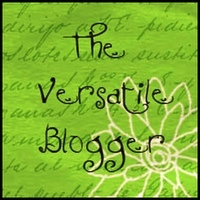 I LOVE her site and recipes, she is a true talent in the kitchen. The original recipe is HERE… and my version follows. Preheat oven to 350 degrees. Combine dry ingredients in a small bowl, whisk to blend, and set aside. Combine remaining ingredients in a medium bowl, using a whisk to ensure everything incorporates well. Slowly add dry ingredients to wet, mixing thoroughly. Scoop dough by rounded tablespoons full onto a parchment lined baking sheet. You may want to shape the scoops into balls with your hands to get a nicer shape. Gently press a wet fork into the top of each cookie to make a criss-cross pattern. 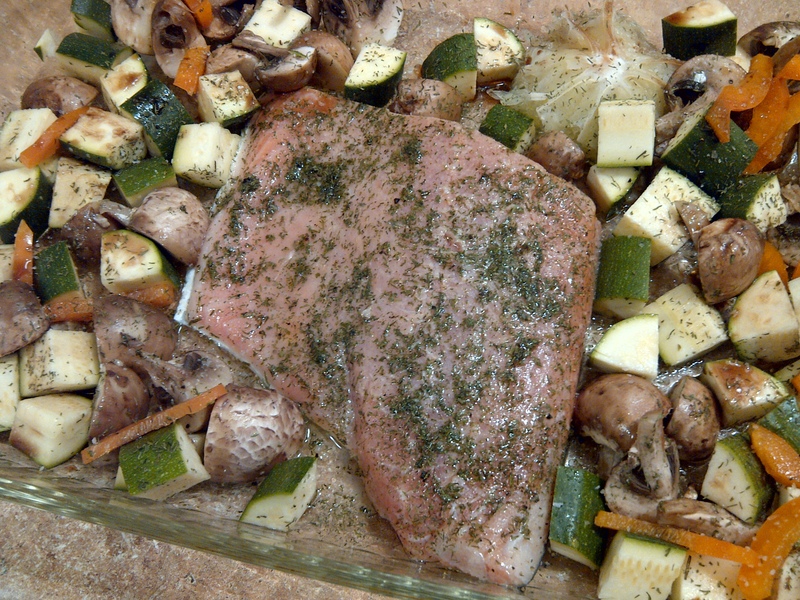 Bake at 350 for about 8 minutes, or until the edges are lightly browned. Remove from oven and allow to cool slightly while still on parchment, before removing to a cooling rack, as the the cookies are very fragile when they are first out of the oven. Makes about 15 cookies. Can you tell that we love fish? Perch is one of the more delicate varieties and I used to serve it up pan-fried, with tartar, and maybe french fries or baked potato. I decided that instead of subbing out flours and attempting to do a different version of pan-frying, I would bake it in the oven and find a substitute for bread crumbs instead, and the results were really delicious! This recipe doesn’t yield a crunchy breading, it is a little on the softer side, and very flavorful, complimenting the mildness of the perch. 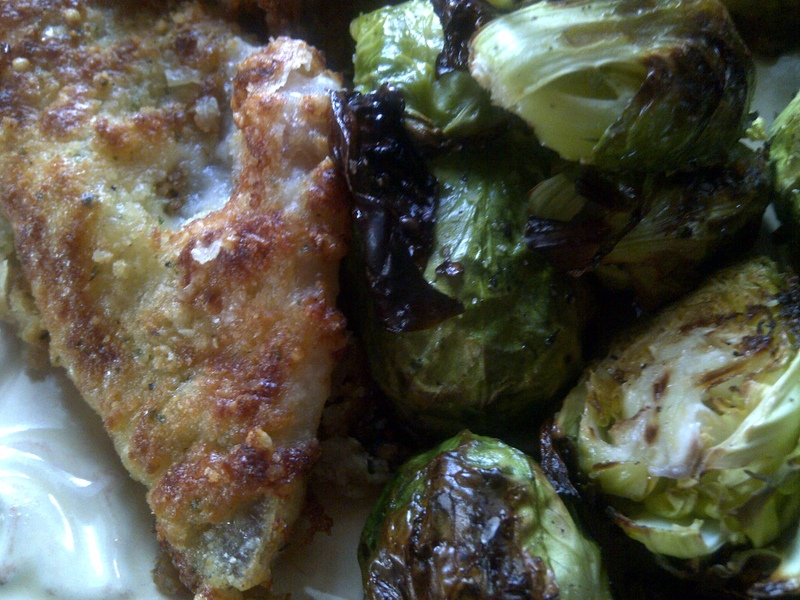 Low-Carb “breaded” perch; No Wheat or Gluten. Preheat oven to 400 degrees. I used my Ninja to process ingredients, but you can also use a food processor. 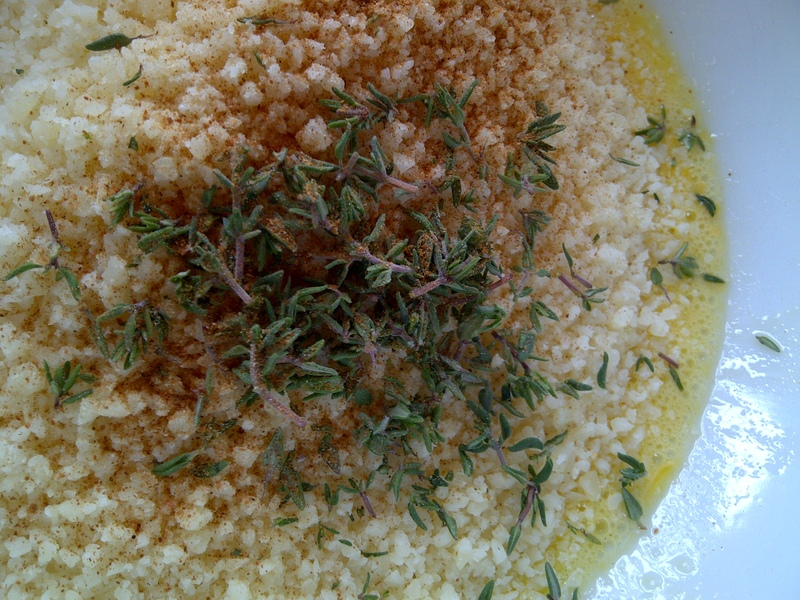 I started with chunked Parmesan, so I zipped it until it was the consistency of grated, then I added the coconut flour, parsley and other seasonings and processed again until they were fine and completely combined. Line a baking sheet with parchment, and coat with non-stick cooking spray. Dredge the fish lightly in the mayo mixture and then press into the cheese crumbs, arrange on baking sheet. Bake for about 15 minutes, or until the fish is firm, but flaky, and the coating is beginning to brown. Roasted Brussel Sprouts: Simply cut each sprout in half and remove the tough and bitter stem end. Toss in a healthy oil (I used walnut oil this time), arrange in baking dish, and season as desired with salt, pepper, garlic and onion powder, or anything your heart desires. Roast at 400 degrees for about 15 minutes. 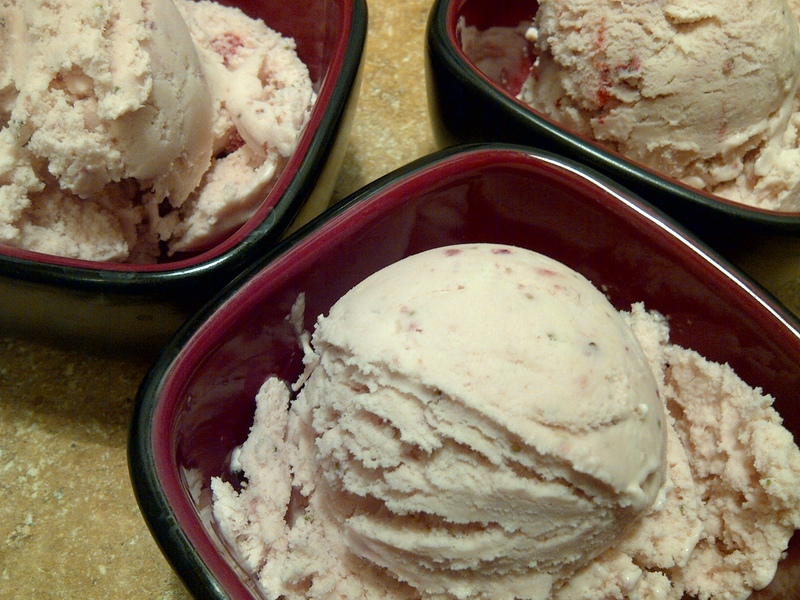 Ice Cream without gluten or added sugars….. It wouldn’t be hard to guess that my favorite desserts are sweet and creamy, and cold, and melty… yes, ice cream is a treat I don’t even like to think of going without! The problem is that the low carb versions still have ingredients in them that I would rather steer clear of, so this is my first attempt at a sugar-free ice cream. It is extremely simple and sweetened only with strawberries and Stevia powder. I will admit that the Stevia is an acquired taste, but I know that eating sugar is something I want to avoid for a number of reasons, so I am acclimating myself to using Stevia as a sweetener. My son likes it, but my husband can’t quite get used to the taste, and will add other things on top of his ice cream or cheesecake, to help mask the flavor. The original recipe is here. If you like using Stevia as a sweetener, this should be right up your alley! This recipe also uses raw organic eggs, which doesn’t bother us in the least, but you could try a substitute if you are squeamish about using them raw, or heat the eggs into a custard first…. but what appealed to me about this treat, is that it is super-duper FAST! No cooling of custard to fool with. I did change the recipe to 3 C of heavy cream instead of the mix of light cream and milk, in order to avoid the milk sugars as much as possible. I am not sure as I would go so far as to say this would be considered “healthy” ice cream, but it is Gluten Free and free from added sugars. I think next time I will jazz up the pale color with a little beet juice! Combine eggs, cream, Stevia and vanilla in a bowl. Use a blender (I like my Ninja) to chop the frozen strawberries, using a little extra cream to loosen them a bit. When the berries seem incorporated into the cream and are the consistency that you would like in your ice cream, add the egg mixture and blend thoroughly. The mixture will be a bit stiff because of the frozen berries. If you don’t have an ice cream freezer, you could probably dish this up now as a soft serve, but I chilled it for about 20 minutes in my Cuisinart Ice Cream maker. (I LOVE that gadget!) Keep in freezer and use within a few days for freshness. If your ice cream freezes too hard, just thaw for 30 seconds at a time in the microwave to loosen it up. When you adapt to a different way of eating which requires you bypass the convenience of processed foods, it’s great to have a few tricks up your sleeve to save you time throughout the week. This cracker recipe is versatile and keeps amazingly well in the fridge, so that you can cut and bake fresh crackers quickly anytime you need them! Here, I often make them fresh for my son’s packed lunch, as well as to accompany soups or main courses, or even just as a filling snack. They are GF and very low-carb, made with almond and coconut flour. 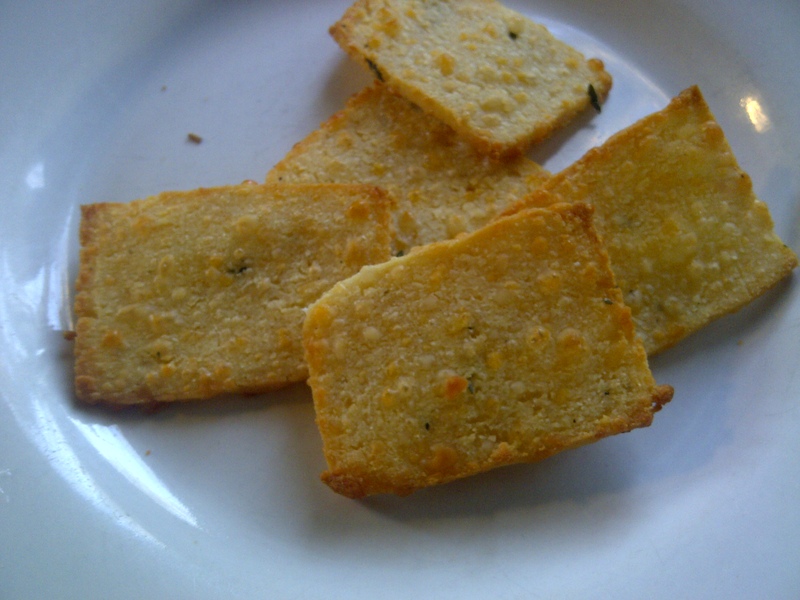 I adapted this recipe from one that I posted in April for Cheddar Crackers. 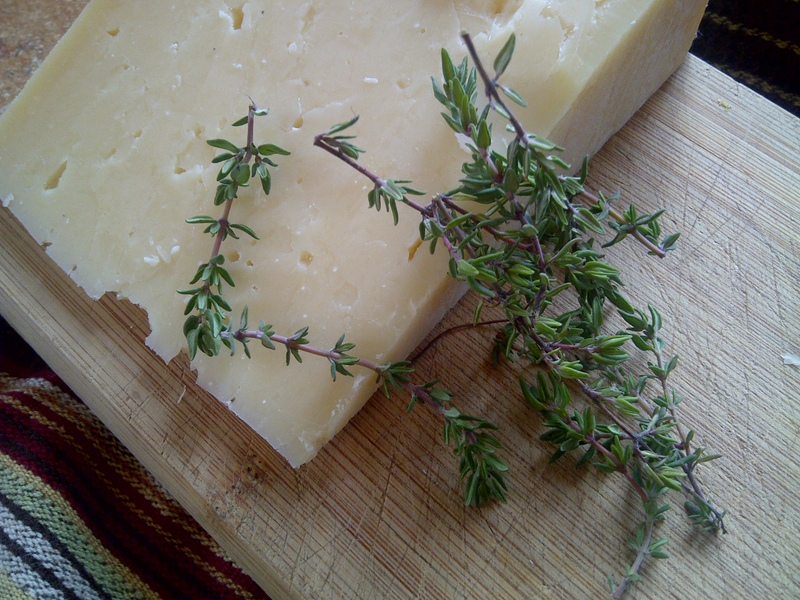 I am sure that there are many cheeses that would work well, and I personally look forward to making this with Swiss cheese and herbs! We were lucky and stumbled on a wheel of good quality Parmesan Cheese for an incredible price a while ago, and we have been enjoying having it on hand in abundance! I sure will miss it when it’s gone…sigh 😉 I also love to use fresh herbs whenever I can, and Thyme is one that is hardy and can be used all year long (I even have been known to burrow into the snow to get it for soup.) Being spring though, there is nice tender new growth, and I have been using it frequently in the kitchen. Heat oven to 400 degrees. Combine eggs, melted butter, and seasonings, mixing well. Add cheeses, a bit at a time, until well-combined. 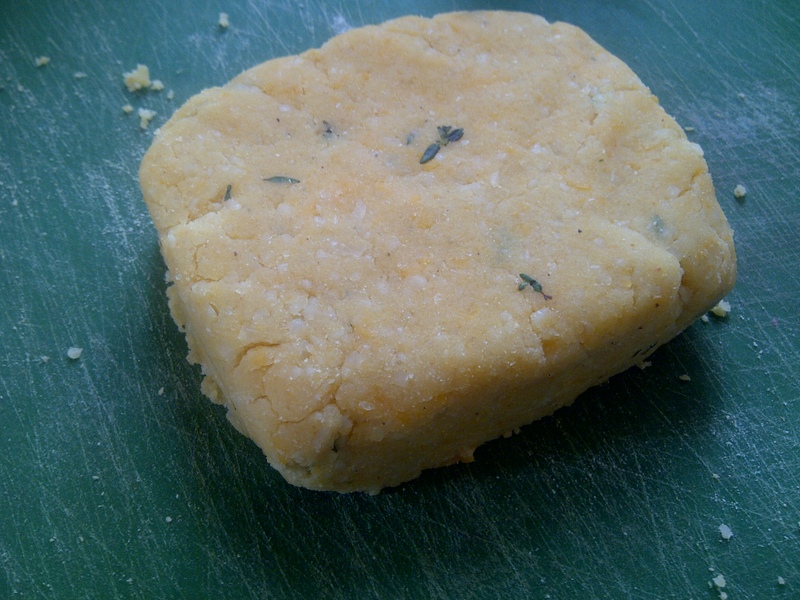 Sift flours together and add to cheese mixture a bit at a time, until a dough forms. Knead the dough non a flat surface with some almond flour for several minutes, until it comes together and you are able to press it into 2 blocks, about 1″thick. You can then refrigerate both blocks of dough, or cut thin slices and bake for 5-8 minutes on a parchment lined baking sheet, or until the crackers are lightly browned at the edges. The thinner you cut them, the crispier they will be. When cut slightly thicker, they are sturdier and can be used as the base for bruscetta or other appetizers.